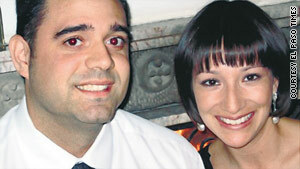 Two of the victims were identified as consulate employee Lesley Enriquez, right, and her husband, Arthur Redelfs. 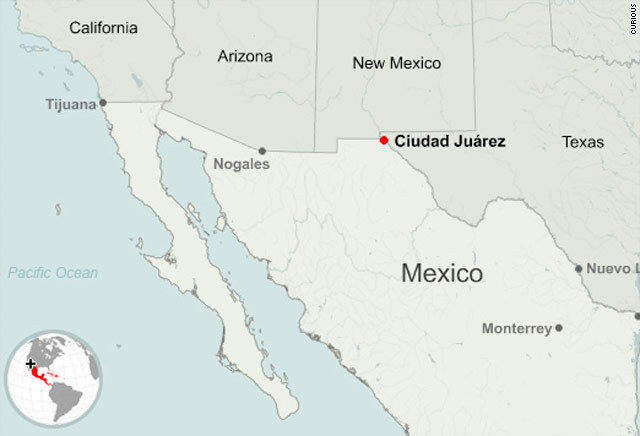 Juarez mayor: "We know that the U.S. citizens were targeted"
(CNN) -- Three people connected to the U.S. consulate in Ciudad Juarez, Mexico, were killed in two drive-by shootings, a senior White House official told CNN Sunday. Two of the victims were an American employee at the consulate and her U.S. citizen husband. Their 1-year-old child, who was in a vehicle with the couple at the time of the shooting, survived the incident, according to the El Paso County Sheriff's Office. The American couple were found dead inside a white Toyota RAV4 with Texas license plates, according to the Chihuahua state attorney general's office. The woman was shot in the neck and left arm, while the man had a bullet wound near his right eye, officials said. "We know that the U.S. citizens were targeted," Juarez Mayor Jose Reyes Ferriz told CNN, saying a police officer witnessed a car shooting at the Americans' car. "We know they were chasing them. We know they wanted to kill them." The Americans were identified as Arthur Redelfs, 34, and Lesley Enriquez by the El Paso County Sheriff's Office, where Redelfs worked as a detention officer. Redelfs was a 10-year veteran of the department, according to Jesse Tovar, a spokesman for the sheriff's office. "On behalf of the men and women of the Sheriff's Office, I would like to extend our deepest sympathy and condolences to the family during this difficult time," said Sheriff Richard Wiles. "Our thoughts and prayers are with them." Authorities retrieved only one shell casing, from a 9 mm weapon. About 10 minutes before authorities received the call, they were alerted to a body inside a 2003 Honda Pilot. Inside was the husband of the Mexican employee, identified as Jorge Alberto Salcido Ceniceros, 37. Reyes said the victim was a state police officer who was married to a Mexican employee at the U.S. consulate. Two children, 4 and 7, were injured in that shooting and transported to the hospital, the attorney general's office said. Police recovered two shells at that scene from an assault rifle, authorities said. "The president is deeply saddened and outraged by the news of the brutal murders of three people associated with the United States Consulate General in Ciudad Juarez," National Security Council Spokesman Mike Hammer said in the statement Sunday. "He extends his condolences to the families and condemns these attacks on consular and diplomatic personnel serving at our foreign missions. In concert with Mexican authorities, we will work tirelessly to bring their killers to justice." In response, the U.S. State Department authorized the temporary relocation of employees' families working in border-area consulates. "These appalling assaults on members of our own State Department family are, sadly, part of a growing tragedy besetting many communities in Mexico," Secretary of State Hillary Clinton said in a statement Sunday night. "They underscore the imperative of our continued commitment to work closely with the Government of (Mexican) President (Felipe) Calderón to cripple the influence of trafficking organizations at work in Mexico." The families of employees at U.S. consulates in Tijuana, Nogales, Ciudad Juarez, Nuevo Laredo, Monterrey and Matamoros, are allowed to leave for a period of 30 days "in response to an increase in violence along the Mexican side of its border with the U.S.," State Department spokesman Fred Lash told CNN. After 30 days, the authorization can be renewed, depending on a review, Lash said, adding that this was not a mandatory evacuation. The announcement was part of a warning to American citizens regarding travel to Mexico. The warning urges U.S. citizens to delay nonessential travel to parts of the states of Durango, Coahuila and Chihuahua, where Juarez is located, because of recent violent attacks. U.S. government employees are restricted from traveling to all or parts of these three states. The attacks include the kidnapping and killing of two resident U.S. citizens in Chihuahua, the warning states. The mayor said the shootings highlight a problem shared by both countries along their border. "It is not just a Mexican problem -- it's is a U.S.-Mexico problem," Reyes said. "I'm very glad that the U.S. has taken that position." He said he supported the State Department's authorization to consular families and that "it is important they feel safe." Mexico on Sunday said that its government was committed to protecting all people, citizens and visitors alike, diplomats or not. "The Mexican government deeply laments the killings of three people linked to the U.S. Consulate in Ciudad Juarez," Mexico's foreign ministry said in a statement. "The Mexican authorities are working with determination to clear up the facts surrounding the crime scene and put those responsible before the law." Juarez is one of the front lines in Mexico's war against the drug cartels that operate in its territory. More than 2,600 people were killed in Juarez in 2009. Juarez, across from El Paso, Texas, has become a focal point of Mexican President Felipe Calderon's anti-drug efforts after the January 31 killings of 15 people, most of whom were students with no ties to organized crime. The incident sparked outrage across Mexico. In the western state of Guerrero, at least 25 people were killed in a series of violent acts on Saturday, state officials said. In the small city of Ajuchitlan del Progreso, 10 civilians and one soldier were killed in two shootouts that started when federal officials tried to carry out search warrants on two locations, Salinas said. Police in the state were on a heightened security alert, he said. The government has not released official figures, but national media say 7,600 Mexicans lost their lives in the war on drugs in 2009. Calderon said last year that 6,500 Mexicans died in drug violence in 2008. CNN's Mariano Castillo and Jamie Crawford contributed to this report.